P and L Fire Protection, Inc. is a family owned and operated business located in Tuttle, Oklahoma who is proud to serve the entire state of Oklahoma. P and L Fire Protection takes pride in their quality workmanship and strives to make their customers happy. 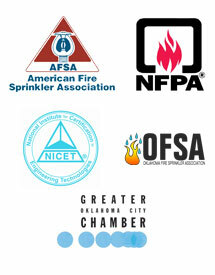 P and L Fire Protection, Inc. has been in business since 1978. We employ 30 employees who have both the experience and commitment necessary to provide our customers with quality workmanship they desire. We are a full service fire protection contractor, focusing on the protection of life, property and business continuance from threat of fire. Our commitment is to provide the best fire protection through design, manufacture and distribution of quality, cost-effective products and services in the life safety industry to meet our customers’ expectations and surpass industry standards. We deliver the finest service in the most cost-effective manner. Exceptional service and loyal customer relationships have resulted in broad referrals and repeat business.